Safe, effective help is available for preventing, ridding most pond pests. Greeting WetWebMedia Crew, I'm currently moving to a new property and am transporting a fairly water lily collection over. I've been told by previous owner they have a fair amount of axis deer moving thru property. Do have any predictions on how the water lilies will fair. The house actually has 2 in-ground ponds and I'm moving some above ground stock tanks over. Do you think the deer will be very attracted to the water lilies or do they have a chance of co-existing without netting and/or fencing? time, I'm a bit worried. I'll keep you posted with any developments. Thanks for the great site. I am writing to you for advise as I have no idea who else my have answers for me. I live in Mallorca, Spain, not many people here keep fish so no real help at hand. I have had ponds n fish for many years and I have a problem I never witnessed before. I have built approx 2 months ago. On Saturday morning, when I got up at 7am I noticed 2 dead koi in the middle of my lawn. Too far away to have jumped and also I noticed between the 2 fish blobs of bird poo. My question is this, what other type of bird takes fish and doesn't eat them? It's not a heron as this is not the time of year and I know herons don't leave fish behind? They are bandits maybe they can dive to take the fish but the fish were too big to take away or eat?? I got up early the next day, nothing happened , the same the next. Today, I got up and found 2 more dead fish unmarked except for a bloody fin and another dead fish in the street!? What can you think of that takes fish out but leaves them? I still am prone to think seagull? But we also have several birds of prey around. so I am unable to see how many are missing. I need to ship in new parts to create better filtration and will also put a shade to resolve the green water. Anyway, I am moving away from my question, pests that behave this way, definitely a bird, any thoughts ?? Thanks for your thoughts. No other types of 4 legged things here that raid ponds. Definitely some type of bird. It's happening after midnight and before 6.30am. Herons wouldn't normally leave the koi behind n they don't have any tell tale spear marks on them. I have spent the afternoon draining my pond n had a headcount and no fish are missing.? So, I have 5 fish taken out my pond on 2 separate occasions n not eaten or taken away???? Koi are not huge , small enough for a heron to swallow in one go. 30-70cm long I guess most of them. It's a bird because of the Poo at the scene of the crime! I will have to net it which seems crazy as here we have heron issue in winter but never now. Already it's very hot here 88 degrees today and the herons have an abundance of fish to eat away from residential areas. I net it always Jan n Feb. until mid March. This house is more exposed so pond more visible I don't know what to think. Now I just need to tackle the green water!! Greetings Crew, I'm stocking a 3 million gallon reservoir with mosquito fish Gambusia affinis. How many fish would you recommend stocking? <Mmm... likely a few to several hundred "will do it" here; with good conditions providing for rapid live-bearing increase. Do ask help from the D/BLNR or vector control... they likely have a ready stock for free. I forgot to mention, the surface area is 80,000sf and 6ft deep. Thanks again I do appreciate it. safely consume the eggs. Thanks again. <Mmm; you're in Hawaii right? DO contact the Bureau of Land and Natural Resources. Unfortunately, DLNR didn't have any suggestions on tadpole removal, except for manual removal. I'm a little confused as to how you could be getting me in trouble. I would not able to import fish/inverts that aren't conditionally approved. If you could shed some light on the subject, it would be appreciated. Thanks for your time. Thanks again Bob. I thought you had a secret biological control, you didn't want to reveal, haha. Found this in my pond today. It was about 1/2 of an inch long. I know it is a larva of some kind. Looks like it could be dangerous to fish. Any idea what species it could be? I did some research. It appears I have a diving beetle larva of some kind. It had a head just like a diving beetle larva. We do have small diving beetle species here in Arizona. A newly hatched goldfish fry might have something to fear from them. But would an older 1 inch fry have anything to worry about? I have a 1,000 gallon Koi pond in my back yard. I have had it for 8 years. I have a fence surrounding my small property and all obvious entrances into the yard have been barred. The last 2 years, I have been attacked by various critters and my fish eaten. The first year, a mink took out 12 of my 15 fish. The second year, I bought 3 more fish. That same year, all 7 were taken. I now have no fish in my Koi pond. I have tried many ways to keep the predators out. Paying big bucks for netting that was supposed to be predator proof, only to find out that they can easily rip holes in it and get in to feast. I have installed night guard eyes that flash to help keep them at bay, but they don't work when the night time passes and mink or other predators don't care whether it's night or day. chewed a hole in the net right next to the trap. I am now not sure I want to go through the heartbreak again of stocking my Koi pond just to supply food for the local wild life. Do you or any of your pond owners have any ideas for me before I take the whole thing out and plant flowers? Please try to get me some answers. Many thanks. I went there, but don't see a link to the electric fence? Help? We have a pond with a bee problem. They gather every day at our pond to drink. Stung a member of my family the other day. The problem here is we cannot spray with pesticide because of the fish living in the pond. Do you have any ideas on how i can drive them off? Bee repellants, smoke, water? Anything nontoxic that might help? Any help here would be appreciated. I also e-mailed a beekeeper, but they have no responded yet. Thank you. Would birds bathing in my pond stress my comet goldfish enough to prevent them from eating? Would bathing birds harm my pond? How do I keep birds out of my pond? Many thanks for considering this. My water lily is full of holes and, on inspection, I saw thin white worms (almost invisible) on both pad surfaces. I also noticed them crawling around the edges of the pond close to the surface of my half-barrel pond. They appear to hide in the gaps between the boards of the barrel. They crawl surprisingly quickly. They are up to 1/4 cm in length. On closer inspection they have forked 'tails' that they appear to paddle with. They have dark heads (possibly red) and a pattern in the same colour on midsection of the upper surface of their white bodies. I'm very curious to know what they are and what to do to protect my water lilies from being destroyed (over 2/3 of the pads have been eaten). I have found it impossible to identify a curious floating entity on my pond. They float around the pond edge, at the base of my reed mace and around the edges of lily pads. They resemble miniature, grey curling leaves. On closer inspection they are segmented. When I looked into the pond last night with a torch I was surprised to find white ones floating on the pond (or were they reflecting the light? I'll have to check that one out). I have never seen them change. They crumble or break up if touched. Perhaps they are clusters of eggs? There is nothing I can find online about these but I have lots of them. I have an outdoor pond in South Florida (about 3,000 gallons) and recently I have been discovering dead fish laying outside of the pond with the head only eaten away. or is there another predator that could be lurking in my yard? I have seen large possums, but I pose the same question here. THIS IS WAR! I'm getting ready to completely re-construct my pond with all new equipment, so maybe this is the time to install some type of device that will keep the mystery predator out. I am new to having a Koi pond, and have been doing well, but something has started messing with it. A few days ago the pump was taken apart and not working. A today there were several large rocks that had been thrown into the middle. I retrieved the rocks using my skimmer to drag them to the side then lugging them out. My fish are (understandably) traumatized now, but none of them seem to be hurt or missing. Is it possible for raccoons to move rocks or would they pop open a pump and toss it back? Hi there. I hope you can help. I have a goldfish that is missing one eye. hiding behind some rocks, but I noticed the other fish are attacking her. Any suggestions on how to save her? I'm afraid they will kill her in the middle of the night while we're sleeping. Any suggestions would be helpful. Thank you in advance. Thank you! We found some mesh wiring and cordoned off an area for her. We will see how she does. Should I add some salt to speed up the healing process or just leave her alone? Thanks again! I came across your great site when looking for some pond answers and got them. I wanted to pass along a tip for providing shelter from birds and other predators. It may not be an original idea, but what I did was go to Fleet Farm (a Midwest chain of agricultural supplies and so much more) and bought a coupling for drain tile. Most people are familiar with the 3 inch or 4 inch flexible ribbed plastic pipe for drainage around a house. The coupling I bought is meant to join two sections of 24 inch drain tile used on farm fields! The coupling is like a 2 foot length of pipe, only joined on one edge by a hinge, and open on the other so it looks like a black cylindrical clam shell with open sides. I cut the hinge so I now had two half pipe pieces. I overlapped the ribs by about 10 inches, then drilled some holes so I could cable-tie the two sections together. I then used a larger drill bit to put a variety of holes for water to flow through (5/8" drill bit). Last, I sanded off any sharp edges. The weight of this Quonset hut means it doesn't need anything additional to keep it on the bottom. I put it in the deep end, and my fish love going through it. If a predator ever came, there is enough room for them, and as I add more fish, I can "expand" the hut. The best part is that it is black, and blends in with the bottom of the pond. Just wanted to pass it along to you, because you seem to be a real helpful pond guy, and we need more of those. I have a large Comet which was taken out of my pond by a bird and dropped in dirt. I have put it back in the pond and it is moving around, but it has a lot of dirt stuck on it. Do I need to get the dirt off or will I do more damage? <I would leave this fish be... the dirt will come off of its own accord. I was wondering if you can identify this growth on the back of this Koi (I don't know if you can make it out in the picture attached)? I don't think it's Ich? Just thought you would appreciate (not enjoy) this picture from today's paper. 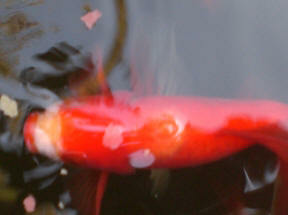 Poor guy (Koi) looks slightly bemused! Hi, I have a predator that is taking fish out of the pond, but not eating them. I have found two of my larger comets lying on the grass a foot or so from the pond's edge with no apparent damage from teeth, beaks or claws. Are my fish jumping out on their own? I have had an Egret and now a herons visit my pond several times a day. Last year it was a white egret. Since the fall and through the winter I have had a heron visiting sometimes twice a day. What can I do to discourage them from returning? Hi, I have a pond outside that is about 200gallons, I have one 2 year old goldfish and 4 others. The two year old is almost 8 inches long and has found a way to stay clear of great white heron attacks while others have perished. Today I went outside to feed then and saw the great white in the back yard. There were a number of scales scattered around and I saw the big fish still alive hiding under a rock inside the pond, I put my hand in the water and he moved around, clearly scared and injured. There are scales missing on both sides of his body as if the bird grabbed him and he got away. I was wondering if there was anything that I can put into the pond to help him heal and not get sicker. The other fish, although hiding, seem to be fine and come out when I open the screen door to bring them food. This happened to one of the other fish abut 6 months ago, but not to this severity, and he is fine now. Do I do anything or just hope for the best and let nature run the course? I live in Maryland and have a 6000 gallon Koi pond. This fall when cleaning my pond, I found many small leaches under some of the plants and stuck to the liner. Is this something to be concerned about? If so, how should I treat the problem ? Thank you for your quick reply. I have not seen any of the leaches on my fish, but I thought it was strange that I found so many of them. They are about 1" long and attach and move like a leach. I had one stick to my hand. I just pulled it back off. If it is OK to leave them in the pond, I would rather not add any chemicals. They do not seem to be bothering the fish yet. As all Hirudineans are parasitic... yours may prove to be problematic with time... Or just die out for lack of a suitable host. Thank you again. I have read the article and am positive that they are leaches. I will try and get rid of most of them. I do not want this to become a serious problem. I have read that you can place a small piece of red meat on a string in the pond for a few hours and then pull it out with the leaches still attached. Does this really work ? I have one other question for you as well. and slowly bring it out of hibernation. I then brought it inside the house in a 50 gallon trash can. I have a small filter and a light on a timer and the wounds on the fish seem to be healing up. I have had the fish inside for over 2 weeks. The problem is, it does not seem interested in food. Do you think the trash can is too narrow for the fish to swim, so it is not happy and it will not eat? Do you think this crazy waking up may have been caused by the leaches? I'm hopeful you can help. Yesterday morning my Husband noticed a Heron around our pond, he went outside to scare him away, as he approached the pond he noticed "Lippy" was laying motionless by the pond. the pond on his side. Occasionally he'll thrash around then settle back at the bottom of the pond. Yesterday afternoon I moved him to the small pond (55gal) which was previously his home before we built our 1000 gal pond. I added salt to the small pond along with Melafix and P.
He is still laying at the bottom of the pond on his side. I don't see any visible signs of damage to him other than the missing scales (lots). What are the chances "Lippy" will survive this ordeal. I don't want to prolong his misery. It breaks my heart to consider having to euthanise him. Any and all suggestions would be greatly appreciated. Hideous things, aren't they! Not my idea of beauty at all. But I can see that they'll sell in droves, even though this species rarely lasts long in "cold" (by its standards) tropical aquaria. but I do wonder if a cold winter would cause problems in terms of immune response. I have a pond in my back yard with gold fish in it. It's been there for about 3 years and I have added no fish. I now have a fish (white lips) that has a large discolored spot on his back with a bump the size of a pencil eraser sticking out about mid body. thank you for your fast reply. So do you think it could be something that will heal itself and go away or possibly get worse? I had wondered if something may of gotten to him. thank you very much, I really appreciate the advice! One of my fishponds has tiny grey, pin-head sized parasites on the leaves. The other pond is unaffected. I can scarcely see them with the naked eye. I brush them off the leaves and they float right back on. When they die, they are white. Could you please advise us how Koi would respond if they were visited by a heron. Would they try to hide somewhere in the pond? Thank you for your response. We can't thank you enough for your quick and informative response! We will absolutely try your suggestions. Thanks again and have a nice day! 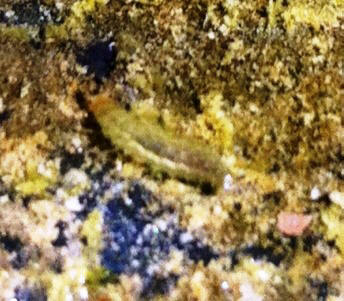 Small (2-3" long) worm like, transparent things attached to the sides of my pond. Looks like a transparent caterpillar until fished out. When fished out they just look like jelly and don't do anything apart from slowly dry out. Any ideas? I've done the search thing and come up nothing much. Leech in my book gives something close but segmented, however your website says the leech stays more or less attached and are usually black? Many, many thanks. That is exactly what it will be. We can fish them out or leave as wished without fear they will eat the few fish we have left. This may be outside your area of expertise, but perhaps you can point me in the right direction. My outdoor water garden is home to two goldfish, plus a variety of plants. The plants have developed a serious whitefly infestation. How can I treat them without harming the fish? Thank you for any advice you can provide. <Here are some ways you can control them that I have heard of: 1. you can plant certain plants that naturally repel whiteflies like marigolds and basil 2. you can purchase predator bugs like green lacewings and lady beetles (problem is they won't stay around) 3. you can put large amount of sticky yellow tape near the leaves due to whiteflies being attracted to the color yellow, or 4. you can remove your fish from the pond and treat with a pesticide. All of my suggestions I have heard of working but never actually seen in action. Your best course of treatment will probably be pesticides due to them being resilient to other methods. Best of Luck! Hello WetWebMedia crew. My name is Russell. I once again need your help. I am wanting to build a outdoor turtle pond for the summer. I have all the supplies needed, but I have a problem. I live in Kentucky, a area know for its mosquito problems. So I was wondering how do I keep the mosquitoes out of the pond? Is there a product I can safely put in the water with the turtles to keep the bugs out? I am building the pond close to my house so I need to keep the pond mosquito free. Thanks you for your help. directory book/s)... for what they use, suggest as a biological control. Magnus Feels Froggy - Gone Fishin' Hello, <Hi there Magnus on call to help.> If you can give me any advice on he following I would be really grateful as I am extremely upset at the moment. I have had a pond for 5 years. I had 10 six year old large common goldfish, 3 three year old golden Orfe 3 three year old ghosts 4 three year old Shubunkins 6 four year old Koi carp (one very large compared to the others) 20 assorted various aged off-spring from the above 2 4 year old tench Numerous frogs of all ages <sounds like you had a really nice collection of fish in your pond.> I have never had any problems with my pond or fish, and the fish showed no fear of anything as they have been left do what they do with no interference. They always came out to get food when they saw me, and had no fear of the net when I skimmed dead leaves off the top of the water. I went away for four days this week. When I returned, I found the pond greatly disturbed, sediment floating on the top, no fish to be seen. <YIKES!> My immediate reaction was that someone had broken into my garden and had fished the lot out. <This is not a unusual idea, My Aunt had someone stealing Koi from her pond and selling them to Koi dealers. Eventually the person was caught, but she had lost thousands of dollars from the few stolen.> But, there was no evidence of this. Eventually I saw two or three fish at the bottom of the pond, and to my horror, two large goldfish with what looked like scratch wounds down their sides and part of their tails missing. Being really upset, I took the decision to empty the pond, take an inventory and now the fish are safe I am considering re-locating the fish to a relative's pond. I was shocked to find that I only had the following fish left. 2 six year old large common goldfish one really damaged ( eight missing) 3 golden Orfe (none missing) 1 three year old ghost ( two missing) 4 three year old Shubunkins (none missing) 2 four year old Koi carp (one very damaged) (4 missing including the largest) 12 assorted various aged off-spring (8 missing) 2 tench (none missing) still numerous frogs, none damaged <OH MY... I'm So sorry to hear of your loss! that is very upsetting, from one goldfish/Koi friend to another I feel your pain.> I just want to know what would have taken all these fish in such a short space of time, could cats have done this, the water level is quite a bit lower than the outside pond wall, how would they have taken so many?, and there was a lot of floating sediment as though the water had really been dredged about. <There are many animals that can do this to a pond. You hadn't mentioned where you are living, but some areas have some really bother some wildlife. A Florida friend of mine lost his goldfish and Koi to an alligator! while I'm not suggesting this is the case here I would sooner think that this is because of an animal than a person. The sediment could be there because of what ever had been attacking the fish scared them to the deepest areas of the pond and they themselves had stirred up the sediment.> I know herons attack fish, but would they have left what looks like scratch marks on the survivors, and would they have landed in the water (about 3' deep) and taken so many, all the largest? <The four culprits that typically are the dreaded enemies of the goldfish pond are Herons (any fishing bird really), Raccoons, Foxes and cats. (foxes are the least concern really, but I have seen them steal fish out of shallow ponds.) Herons are the worst. They can get into anywhere and will literally fish a pond empty in a short while. They won't leave a pond until they have either emptied it, can no longer catch them, or the other fish are to large to swallow. A heron will try to get any fish into their mouth, and with big fish you can see the scrapes and the scars on their body where the bird had tried to eat the fish but either couldn't get it out of the water, or couldn't swallow it. Raccoons, cats and foxes are bad, Raccoons will wade out to get goldfish, check your fences or garbage cans to see if anything else is disturbed that will show you if you had a raccoon in your pond. These animals will scrape up a fish if they can't catch and hold on to it.> I found no fish bodies anywhere in the garden (but I do have foxes who may have taken them), no dead fish in the water. <if there aren't any bodies in the garden then most likely it was a heron. 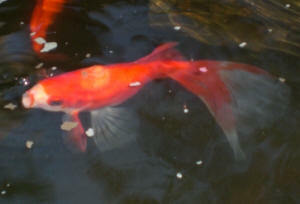 Fish dead in the water might have been eaten by the other goldfish.> But the remaining fish were extremely timid. I was very attached to all my fish, and this experience has put me off stocking a pond with fish again. Does this sound familiar to you. I really need advice so that I can decide what to do in the future. <Sadly this does sound very typical. My other aunt lost over 5 thousand dollars in goldfish and Koi from her pond by ONE heron in a few weeks time... They repeatedly scared the bird off before it could eat, but it managed to snag a couple fish here and there. They are fast birds and will do damage to the pond fast. Keep an eye out if it was a heron than your culprit will most likely return to the seen of the crime. There are measure you can take to protect your fish, by putting on alarms or sprinklers to scare away the birds. Also you can string fishing line around the pond so that the birds are incapable of flying into or getting to the pond. I would look online at other goldfish/Koi pond owners (preferably local one) and see what measure they have taken.> Thank you in advance of any advice you can give me. Best Wishes Julie Peek <Julie, I'm sorry to hear of your loss, and I do wish you the best of luck in the future. Try not to give up hope. -Magnus.